A Work Table has not been Selected Yet... Click Here to Begin. What is a "Super Heavy Duty Series" Drawer? Advance Tabco Deluxe Series Drawers is a Premium Style Drawer. These drawers are made with stainless steel front and sides with patent pending integral Ball bearing slides and noise reduction. Drawers are self closing and has a drawer stop tab to prevent the drawer from pulling all the way out . This drawer also has a removable stainless steel inset for cleaning and is NSF Approved. What is a "Deluxe Series" Drawer? Advance Tabco Deluxe Series Drawers are made with a Stainless steel front and have a removable inset for cleaning. What is a Standard TA-25 Caster? Advance Tabco Standard Casters have 5" Swivel Casters, Brakes on 2. They have Rubber Wheels and will support 125 Lbs. per caster. what is a Super Heavy Duty TA-255 Caster? Advance Tabco Heavy Duty Casters have 5" Swivel Casters, Brakes on 2. They will support 1000 Lbs. distributed weight. 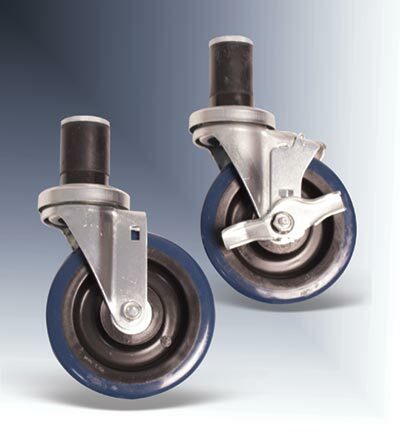 Caster Wheels are made of Non-Marking Polyurethane. Can I add additional brakes to the Casters? Yes. You can add brakes on ALL Casters. Please use Model (TA25B). 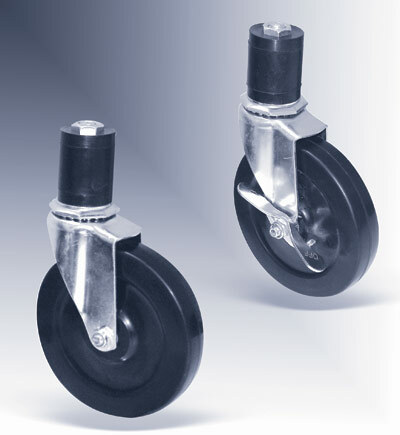 Can I upgrade the standard Rubber Casters to Non-Marking Polyurethene Casters? Yes. You can upgrade the caster wheels. Please use (TA25C). This upgrade is for the Standard Casters Only. How Many Casters Come as a Set? Casters are sold with 4 Casters Per set, However, Tables 8' or Larger require a 6 Casters which are also available. What is a "Bullnose" Edge? Advance Tabco Bull Nose Edge comes standard and appears on the front and back are rounded allowing for a comfortable work surface. Sides are square, allowing the table to rest flat against another surface No charge. What is a "Square" Edge? All 4 sides are square, allowing for the table to fit flush against another surface. There is No charge for upgrading to this edge, but must be selected as it does not come Standard. What is a "Countertop (marine/no drip)" Edge? Edges are made square, but with a raised groove. Prevents liquid or small items like screws or beads from spilling or rolling onto floor. Are Advance Tabco Integral Sinks NSF Approved? Yes. These sinks are approved by all NSF standards. Do these sinks include a faucet? Yes. These sinks come with a standard deck mounted faucet. An optional splash mounted faucet is also available. What is a "Mid Mount" Potrack? Mid Mounted Pot Racks are used on work tables that will be worked on from both sides. What is a "Rear Mount" Potrack? Rear Mounted Pot Racks are on the rear of work tables that have no rear splash, allowing maximum work space from one side only. What is a "Splash Mount" Potrack? Can the Utensil Bars fit any Post? Advance Tabco Utensil Bars are manufactured to fit a standard Advance Tabco 1-5/8" Post. Yes. These bars are adjustable to any hight and can conveniently hold utensils or even pots and pans. Can I add more than One Utensil Bar? Yes. You can add an additional Utensil bar to any of the Pot Rack Components shown above. Does the Utensil Bars come with Hooks? Yes. All Utensil Bars come with Double sided hooks. Quantity of hooks will vary based on Length of Utensil Bar. What is a "Mid Mount" Ovsrshelf? Mid Mounted Overshelves are used on work tables that will be worked on from both sides. What is a "Rear Mount" Overshelf? Rear Mounted Overshelves are on the rear of work tables that have no rear splash, allowing maximum work space from one side only. What is a "Splash Mount" Overshelf? What Side Splash heights are available? Side splashes are available in heights of 1-1/2", 5", and 10" (the same sizes as your backsplash that you selected). Can a Side Splash be on Both Sides? Yes. Side Splashes can be added to the left, right, or both sides of a table. Typically side splashes are used on tables with a sink built in, to keep water from splashing off the side of the table. PLEASE NOTE: All prices are list prices. A representative from J & E Restaurant Supply will contact you with your actual pricing.